Description: Survive 10 days of the zombie apocalypse until the rescue team arrives. Shoot zombies, buy new weapons, ammo and health. 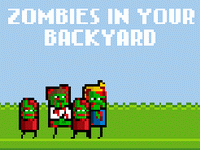 Instructions: Use your mouse to click and kill the zombies in your backyard.